RAGGTOPP Plastic Window Cleaner and Protectant Kit 01162 - California Car Cover Co. 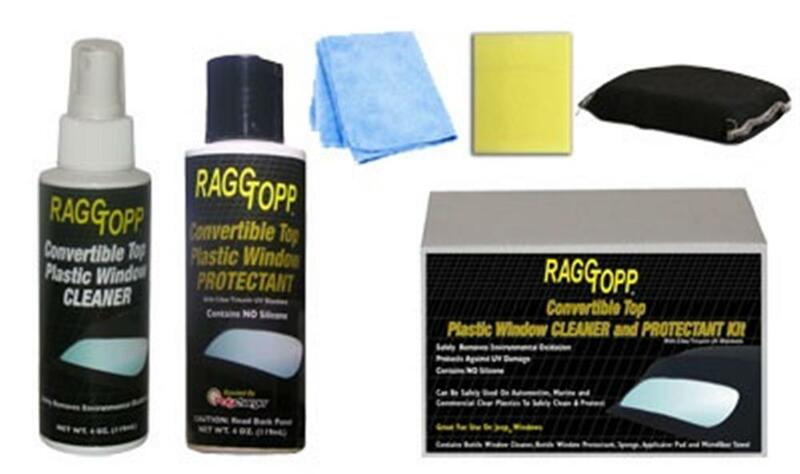 The RAGGTOPP Plastic Window Cleaner and Protectant Kit is the perfect kit to clean and maintain the windows in your convertible top or any vehicle that has plastic windows. This RAGGTOPP kit contains a bottle of window cleaner, a bottle of window protectant, a sponge, and applicator pad and a microfiber towel. RAGGTOPP Plastic Window Cleaner and Protectant safely removes environmental oxidation, protects against UV damage and safely seals exterior automotive plastics by blocking out moisture and dirt. Can be safely used on automotive, marine and commercial clear plastics and helps guard against yellowing. RAGGTOPP window cleaner safely removes grime, water spots, contaminants while polishing the plastic to a brilliant transparency.